Eastern Funding offers many solutions for laundromat funding – from acquisition loans for laundromats to coin laundry equipment financing. One laundromat financing solution offered is our SBA 504 loan product. SBA 504 loans can be an effective tool to finance your laundry business. The advantages of an SBA 504 can extend into many areas including collateral, loan fees, and down payment. If you are ready to explore the benefits of SBA 504 financing for your laundry project, Eastern Funding can help. 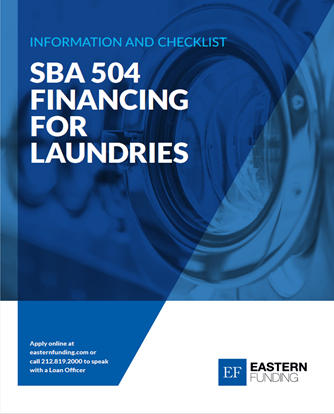 Start by downloading our SBA 504 Financing for Laundries checklist. It lists items you’ll need for SBA loans for laundromats.